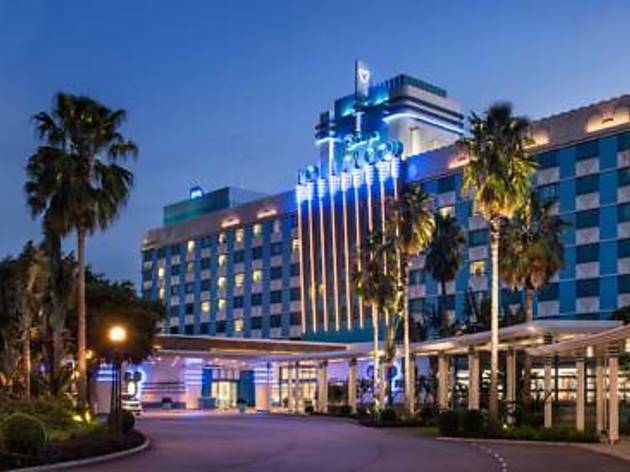 Combing stunning Art-Deco architecture with dash Disney magic, Disney’s Hollywood Hotel offers sophisticated accommodation located just near Hong Kong Disneyland Park. You can strike a chord at the piano-shaped outdoor pool, or take a relaxing stroll in the lush garden courtyard. Besides a variety of international food, the onsite buffet restaurant also offers the opportunity to dine with Chef Mickey. Free scheduled shuttle service between the hotel and Hong Kong Disneyland Park is available, which takes about 5 to 7 minutes. 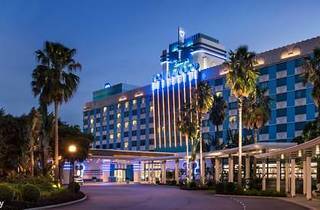 The hotel is 20-30 minutes' walk from MTR Disneyland Resort Station. Hong Kong International Airport can be approached by a 30-minute MTR ride or a 20-minute taxi drive. All 600 Rooms at Disney’s Hollywood Hotel are classic yet contemporary, paying loving tribute to the Golden Age of Hollywood. Featuring special Disney furnishings, each room comes with a flat-screen TV, work desk, in-room safe, refrigerator and air conditioning. Most of the guest rooms consist of 2 double beds and can accommodate up to 4 people. Private bathroom has a bathtub or separated walk-in shower. Themed room decoration packages can be purchased to add a magic to your stay. Immerse in Disney’s world of animation while you meet the star Chef Mickey and delight in delicacies from around the world that he has specially prepared at the restaurant of Chef Mickey and enjoy Western and Asian cuisine at a quick-service restaurant, Hollywood & Dine. Last but not least, You can enjoy your favourite cocktail any time from the full-service bar, Studio Lounge. At Disney’s Hollywood Hotel you can snap photos or share hugs with your favourite Disney Characters during daily surprise appearance in the lobby, or enjoy classic arcade-style fun at Malibu Games. There is also an outdoor playground for children to climb and play. You can also learn to draw Disney Characters and make towel animals as well. Complimentary wireless internet is available in all Guest rooms, hotel public areas and inside the park.